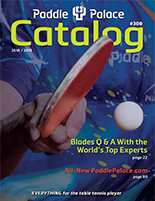 The Stiga League Paddle Shaped Case can hold one paddle. Zippered pocket on exterior can hold up to three balls. Colors: Black with Gold, Red, or Orange accent.